The systems of a building. These are the systems that go into the structural shell of the building for occupancy. 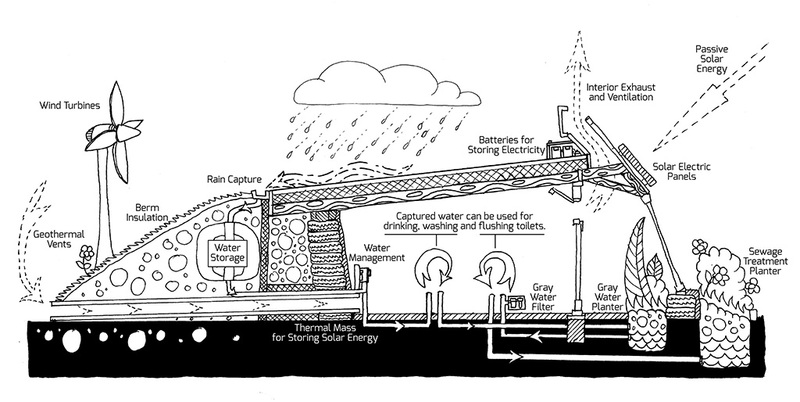 Some or all of these systems can be used instead of the conventional methods to provide utilities to buildings. This can make the build more sustainable, secure and healthy than only using conventional utilities. All systems can have automated conventional backups. 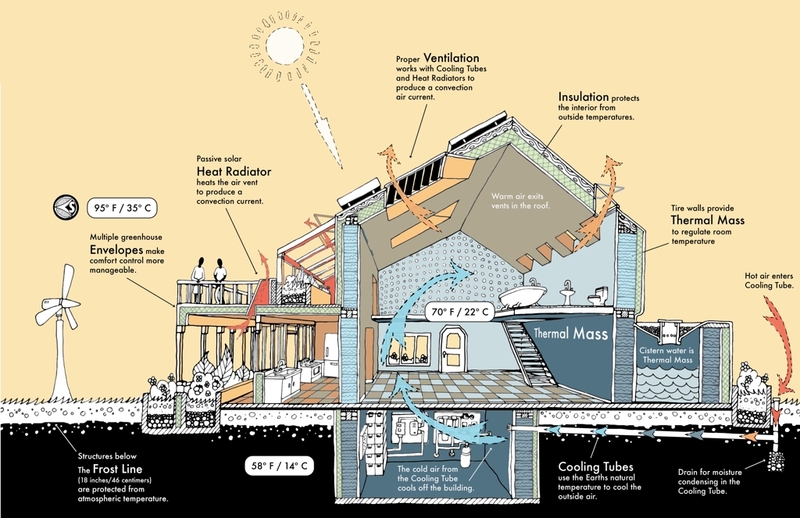 All systems can be added to existing conventional buildings as a renovation project. Living with sustainable off-grid systems enhances our lives, secures our lives and is a better investment than conventional buildings. This increases both psychological and physiological comfort. From the sky (rain & snow melt). Use each drop four times. Fresh, Potable, Drinking Water. From the sun and the wind stored in batteries and supplied to your electrical outlets via a prepackaged power system. Containment, treatment and distribution system for liquid waste water. This system is similar to the wetlands concept which has long been used in exterior applications for thousands of years by humans and nature. This system differs from the wetlands approach in that it treats and processes the untreated greywater inside the building and the liquid waste water from the toilet outside of the building. From only the sun and the earth. Maintain comfortable temperatures all year with no fossil fuels. The security of self-sufficiency and the freedom that comes from living with offgrid sustainable systems. Likely the first advantage that comes to mind when considering an off-grid lifestyle is eliminating utility expenses. Exploring alternatives for power, water, and sewer is a great way to reduce the cost of living. When we are responsible for our own resources we are more aware of where they come from and how much we are using. Eyes-wide-open awareness is the most effective way to bring true change in any area of life. When tied to the grid we are tied to more than just the electric company. There are so many variables that could cause us to be without power. We want to eliminate that risk as much as possible. Not just by creating our own electricity but learning to live without it too. Living off grid gives you options. Maybe you want to live in a yurt with no amenities. How about an RV? A tiny house? You might want a big house with every convenience but on a property that is too far from the electric grid. These are all possibilities off grid. Being free from the electric grid means that you can position your house in the best or most beautiful place on your land no matter how far it is from the electric lines. Our family has really enjoyed our garden and livestock so much! Learning how to grow, harvest and preserve our food feels incredible. We are looking to expand that into so many other aspects of our off-grid life. Learning how to use much less electricity, recycling gray water and having a composting toilet are great ways to reduce your carbon footprint and make off-grid living work. I am excited to learn more about solar, harvesting water, building from the ground up and living more in touch with our land. This might be the thing we are most excited about, building our homestead from the ground up. To be able to really express who we are in every aspect of our lives then look back and see all that we have learned and accomplished. Living off-grid is a chosen departure from everyday modern life in some form or another. That departure causes change, even if it is as simple as hanging the laundry to dry instead of throwing it in the dryer. Many off-grid tasks connect us to nature and life outside of a screen. We plan on embracing that with open arms. Going off grid is not the wonder-drug that will solve all of your troubles. There are many choices that can be made, no matter where you live, to reduce your carbon footprint. For our family, it is the combination of all of these reasons that inspire and compels us to work toward our dreams of building our off grid homestead.